Team PokerStars Pro Bertrand “ElkY” Grosspellier kicked off the EPT Grand Finale tournament series with a win in the €25,000 high-roller tournament, where he picked-up the €525,000 first-place prize-money. Another high-roller tournament closed out the EPT Grand Finale tournament series –this time a €10,000 6-handed NLHE event—and once again the winner was ElkY, as he rolled to his second win of the series. ElkY pocketed a further €153,000 for the win, putting his overall take from the EPT Grand Finale at nearly €780,000 –just over $1 million USD, despite not cashing in the Main Event! Grosspellier is now 26th on thehendonmob.com’s all-time money list, making him the highest ranked French poker player on the list. 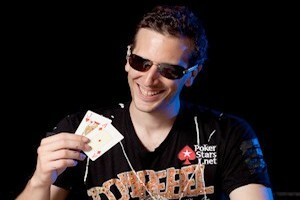 With the WSOP right around the corner, could this be the year that ElkY finally breaks-through with a WSOP victory? Having burst onto the poker scene in the online poker arena, the former Starcraft player has been tearing up the live poker tournament scene since 2006, and has now amassed over $7.5 million in live tournament earnings for his career according to thehendonmob.com. This entry was posted on Sunday, May 15th, 2011 at 12:11 pm and is filed under Poker News. You can follow any responses to this entry through the RSS 2.0 feed. You can leave a response, or trackback from your own site.